Applications on plain paper are Invited from the candidates /doctors (Non PSC) /Retired) who are permanent residents of the J&K State for engagement on “Academic Arrangement based’ in terms of SRO-384 dated 14-12-2009 , read with SRO 409 dated 19-09-2013 initially for a period of one year extendable up-to maximum of six years (subject to good performance and conduct) or till the selection /promotion is made on regular basis in accordance with J&K Recruitment Rules, Governing the respective posts, by the Public Service Commission/DPC whichever is earlier, in the below mentioned disciplines for at the level of Professor and Associate Professors, Govt. Medical College, Doda. 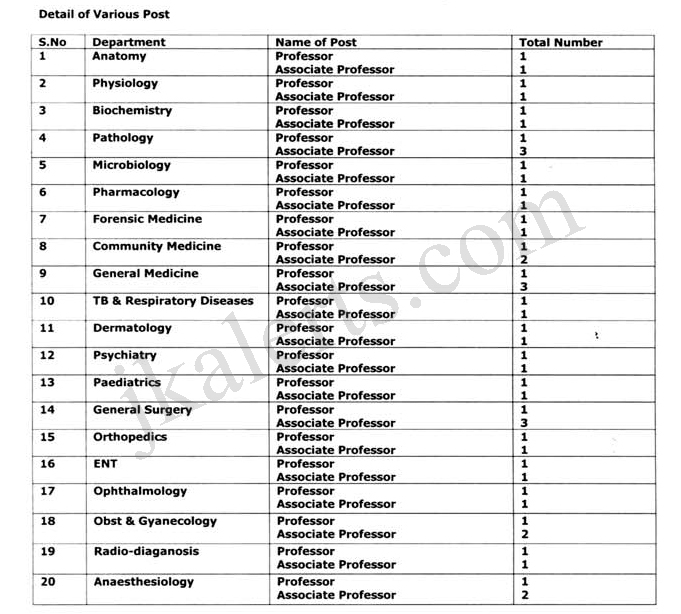 The applications should reach the camp office at Postgraduate Department of Surgery, Govt Medical College Jammu, within 10 days of publication of advertisement. Pay and Allowances Shall be as prescribed under existing relevant rule both for retired officers from Govt Institutions and Candidates from Open Market. The selection shall be strictly as per SRO-88 dated 14-03-2016 and as per J&K Medical Gazetted Recruitment Rules 1979 and any relaxation will regard eligibility Criteria given by Administrative Department or any amendment in SRO 384 read with 409 issued by the competent authority or any other relevant directions Issued by the administrative department shall be applicable directly w.e.f date of its issue prospectively. The applicant shall also be entitled to House rent allowance as applicable to in-service candidate as permissible under rules. Provided that the appointment under these rules shall not entitle the appointee to any preferential claim for regular appointment. Provided further that the appointment on academic arrangement basis shall by itself stand terminated on the attainment of 65 years of age by the appointee. The candidates are advised to enclose the attested true copies of the following documents with their application forms which should reach in the office of the undersigned by or before 15-11-2018. 1. Attempt Certificate of all examinations of MBBS/MD/DNB/Ph.D of any other qualification issued by the University. 3. Post -Graduate Degree/Diploma Certificate. 4. Professional Publications in an indexed/ National Journals as prescribed. 7. Any other certificate pertaining to the Speciality. The eligible candidates shall have to appear before the selection Committee constituted by the Government under the Chairmanship of Commissioner/Secretary to Govt., Health & Medical Education Department, at Government Medical College, Jammu along-with all original testimonials and other related documents at the time of Interview. The academic merit shall be commuted as per the preset/preapproved rules for each candidates for the purpose of selection. In case of any dispute. The decision of Chairperson of the selection committee shall be final. NOTE: Any dispute immerging due to any reason, the decision of Chairman of the Constituted committee shall be the final.